Business leaders and politicians jammed into a tent in the Seaport today to celebrate the coming of a 1,000-plus room Omni hotel. Welcome to Talking Points for Monday, May 15. Cyber sleuths hunt for the perps behind the “WannaCry” ransomware. Beth Israel Deaconess adds new partner in its mega-merger with Lahey. Thermo Fisher goes shopping and spends billions. Plus Jon Chesto checks in on what will be the Seaport’s biggest hotel. 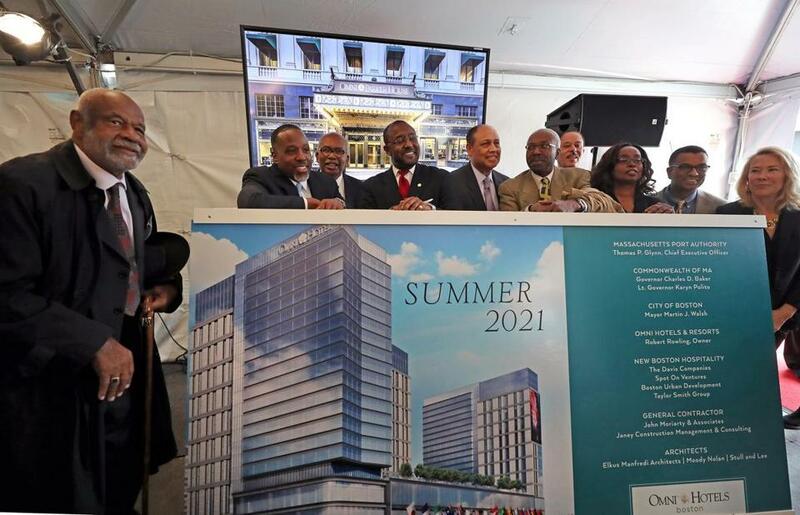 Boston's massive new hotel: Business leaders and politicians jammed into a tent in the Seaport today to celebrate the coming of a 1,000-plus room Omni hotel. But they chose not to focus on one important aspect of the project’s history. This thing almost didn’t happen. Governor Charlie Baker put the hotel’s future in doubt two years ago when he shelved an expansion of the Boston Convention & Exhibition Center across the street, citing the costs. Massport, the hotel site’s owner, eventually pursued a much smaller concept. Instead of more than 1,000 rooms, Massport would accept proposals with as few as 250. In the end, Massport officials got the massive project that they wanted. Omni is unusual in that it develops, owns, and operates its hotels, giving it more flexibility. Omni also has a strong team of local partners. And the company figured out how to build a big hotel on one Massport site, instead of on two, reducing land costs. This was done by incorporating a chunk of smaller-than-normal rooms into the design. Massport officials say the agency will receive about $100 million over the course of the long-term lease. Massport agreed to a reduced rate in the early years, but officials say they’re still getting the market value when all payments are totaled. Meanwhile, the convention center expansion remains an open question. It’s hard to imagine that happening without a subsidy, likely from hotel taxes. But the politicians who represent South Boston aren’t giving up on that one. The new hotel might drive the expansion now, rather than the other way around. Eleven’s company: Add Anna Jaques Hospital to the list of health care organizations joining the merger of Beth Israel Deaconess Medical Center and Lahey Health. Newburyport-based Anna Jaques brings to the table 123 beds and about 1,200 employees. The hospital has had a clinical affiliation with Beth Israel Deaconess since 2010. Beth Israel Deaconess, which owns four hospitals, and Burlington's Lahey, also with four, announced plans to merge in January. New England Baptist Hospital in Boston got in last month, while Mount Auburn Hospital in Cambridge said it’s considering joining the party. Thermo Fisher goes Dutch: Thermo Fisher Scientific of Waltham says it will pay $7.2 billion to acquire Dutch drug development and manufacturer Patheon. Thermo Fisher’s purchase of Patheon more than doubles Thermo's sales in the business of developing and producing drug compounds and ingredients for pharmaceutical and biotech companies. The Patheon deal is the second largest of more than a dozen takeovers engineered by Thermo Fisher since 2006. The largest was the $13.6 billion deal for California genetic testing giant Life Technologies Corp. in 2013. Biogen buys new drug: In a bid to diversify, Biogen is paying a New York pharmaceutical company $120 million to acquire an experimental drug. The drug, Ciara, treats large hemispheric stroke with brain swelling, which affects 1.7 million people a year in Europe, Japan, and the US. Cambridge-based Biogen is acquiring Ciara from Remedy Pharmaceuticals and is hoping Ciara’s orphan drug and fast track status from the Food and Drug Administration can help accelerate its trip to market. Biogen is known for drugs that treat multiple sclerosis and spinal muscular atrophy, a space where it faces fierce competition. Cybersecurity update: Four days after the initial attack, cybersecurity officials said the spread of the “WannaCry” ransomware has slowed. At a White House briefing, officials said less than $70,000 had been paid in ransom, but that it also was unaware of instances in which a payment has led to the recovery of data. Meantime, investigators are hunting for the masterminds behind the attack that hit more than 150 countries. The Globe’s Evan Horowitz lays out what you need to know. They want another scoop: President Trump wants to cut the tax rate on offshore profits returned to the US to 10 percent from 35 percent. US corporations say that's not deep enough. Vacation (all I ever wanted): Wouldn’t it be great to have unlimited paid days off? Harvard Pilgrim Health Care employees do, the Globe reported today. The Wellesley health insurer no longer restricts worker paid time off, following the lead of tech startups and a growing number of mainstream corporations. The move affects 1,000 workers, most of whom took three or four weeks of vacation each year and accrued a six weeks maximum (which could be carried over year to year). As the lines between work and personal lives disappears (Sunday is the new Monday! ), Harvard Pilgrim wants to give its workers flexibility and a morale boost. So far, about 2 percent of employers don’t cap paid time off, Boston-based General Electric among them. Studies show workers typically take the same amount of time or less. Harvard Pilgrim supervisors will be giving employees reminders that they should take time off. Harvard Pilgrim benefits, too. The health insurer believes the new policy makes it an attractive employer in this tight labor market. Also, Harvard Pilgrim doesn’t have to pay out unused vacation, potentially saving the company money. Talking Points newsletter is compiled by Edward Mason. Follow him on Twitter at @EBMason. If you liked what you've read, please tell your friends to sign up.